'Bonsai Inspirations 2', the second book from Bonsai4me.com/B4Me Publishing, is due for release on March 15th 2012. 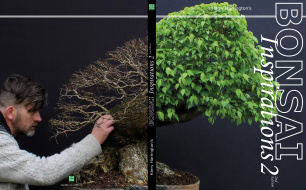 Divided into 5 main chapters, each chapter covers the progression and development of a bonsai, illustrating in great depth how impressive and majestic bonsai can be created from humble beginnings. This image taken from the introduction page was taken early one late-Summer morning, as the sun rose over the Chiltern hills near my home in Buckinghamshire, England. This Tilia cordata/Lime or Linden Bonsai was developed over 11 years from a sapling. The first part of the book details each step of development of the tree over the years with a focus on nebari/surface root development. The second part of the book features two Larix decidua/European Larch bonsai, developed over just 18 months, illustrating how bonsai can be developed relatively quickly from field-grown material.